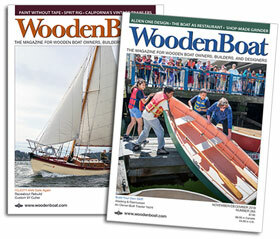 Each summer, the WoodenBoat School offers several classes in which students can build their own boat. In a week, students often get their hull built, and take it home to finish the interior as time permits. In June 2015, thirteen students built seven Annapolis Wherries from kits created by Chesapeake Light Craft in Annapolis, Maryland. Geoff Kerr has been teaching classes at the WoodenBoat School and Chesapeake Light Craft for many years. 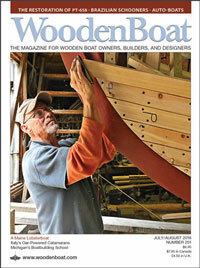 He is the sole proprietor of 2 Daughters Boatworks in Westford, Vermont. The design of the Annapolis Wherry derives from 19th-century livery boats that moved gracefully and quickly in their work on the River Thames in England. These are light, open boats designed for sliding-seat rowing, gliding through smooth water and handling choppy seas with stability.